After asking this question, I finally found what I needed, so I am answering it. I am working on creating a new set of services in ASP.MVC MVC 4 using the Web API. So far, it's great. I have created the service and gotten it to work, and now I am trying to consume it using JQuery. I can get back the JSON string using Fiddler, and it seems to be ok, but because the service exists on a separate site, trying to call it with JQuery errors with the "Not Allowed". So, this is clearly a case where I need to use JSONP. I know that the Web API is new, but I'm hoping someone out there can help me. 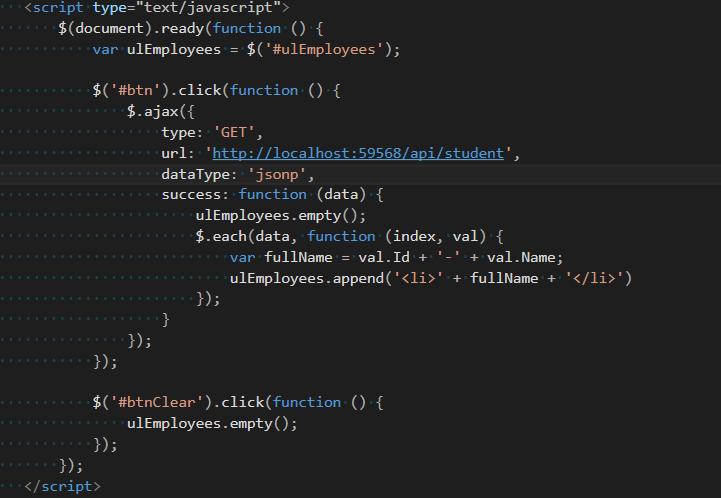 How do I make a call to a Web API method using JSONP? Rick Strahl's implementation worked best for me with RC. johperl, Thomas. The answer given by Peter Moberg above should be correct for the RC version as the JsonMediaTypeFormatter that he inherits from uses the NewtonSoft Json serializer already, and so what he has should work with out any changes. Unfortunately, I don't have enough reputation to comment, so I'll post an answer. @Justin raised the issue of running the WebApiContrib.Formatting.Jsonp formatter alongside the standard JsonFormatter. That issue is resolved in the latest release (actually released some time ago). Also, it should work with the latest Web API release. Check this one out. See if it helps. What is JSONP all about? How can I produce JSONP from an ASP.NET web service for cross-domain calls?